Study dispersal, migration, behavior, social structure, life span, survival rate, reproductive success, and population growth. At the Bird Observatory, we band to study the seasonal and long term population patterns of migratory, wintering and year-round resident birds. Banding allows us to track individuals, which is important in factoring survival, migratory turnover rates, and longevity. Additionally, banding birds allows us to examine individual response to the riparian restoration at the Coyote Creek Field Station. These data are important for land managers and those designing future riparian restorations to create habitats that can support healthy, vibrant bird populations. 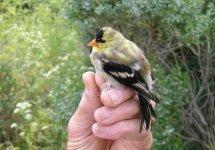 Data Entry Volunteer: We capture hundreds of birds each year at the Coyote Creek Field Station. Extensive data is collected for each individual we catch, Bird Observatory biologists need these data entered into our database before they can analyze them. Predator Patroller: Join our team of long-term volunteers and help patrol the mist nets for predators (mostly foxes, cats, and occasionally raptors). You will also be responsible for alerting other volunteers when birds are captured in the nets, transporting birds back to the banding trailer, and helping record data as needed. Individuals able for volunteer for an extended period of time (two or more years) will be offered training opportunities to progress to the Extractor position after the minimum Predator Patroller time commitment has been fulfilled. Extractor: We are looking for volunteers with previous mist-net extraction experience to join our team of long-term volunteers and help patrol the net lanes for predators (mostly foxes, cats and occasionally raptors) and extract birds from mist-nets. You will also be responsible for transporting birds back to the banding trailer and helping record data as needed. Individuals able to volunteer for an extended period of time (three or more years) will be offered training opportunities to progress to Bander position after the minimum time commitment has been fulfilled. Bird Bander: We are looking for experienced bird banders to join our team of long-term volunteers. You must have experience ageing and sexing passerines, extracting birds from mist nests, operating a banding station, and recording data. Individuals able to volunteer for an extended period of time (five or more years) will be offered training opportunities to progress to a Trainer-level position, which would involve training fellow volunteers in Patrolling, Extracting, and Banding. Volunteers can join other SFBBO citizen science projects and can attend trainings about bird banding. Volunteers can also work in positions such as Prize Procurement Volunteer, Photo Library Organizer, and Bird Observatory Archivist and Librarian. Data Entry Volunteer - Experience Required: Familiarity with Microsoft Windows OS and the Microsoft Office environment. Other Qualifications: Familiarity with banding data and Microsoft Access a plus. Predator Patroller - Experience Required: None. Other Qualifications: Ability to work well during early mornings and in a team environment, stand for several hours and walk on uneven trails. Must be able to identify local predators, including differentiating between Red and Gray Fox. Station Extractor - Experience Required: All applicants, regardless of previous experience, will perform the duties of a Predator Patroller for an introductory period (may be up to the full six months required under the Predator Patroller description), until the CCFS Manager or a qualified trainer is able to perform a field evaluation of the applicant's skills and experience. In order to qualify for the field evaluation and expedited Extractor training, applicants must have previous mist-net extraction experience. Previous experience with western Passerines is a plus. Other Qualifications: Ability to work well during early mornings and in a team environment, stand for several hours and walk on uneven trails. Must be able to identify local predators, including differentiating between Red and Gray Fox. Data Entry Volunteer - Orientation: As Needed. Predator Patroller - Orientation: As Needed. Individuals able for volunteer for an extended period of time (two or more years) will be offered training opportunities to progress to the Extractor position after the minimum Predator Patroller time commitment has been fulfilled. Extractor - Orientation: Volunteers will perform the duties of a Predator Patroller while their skills are evaluated by a qualified trainer. Individuals able to volunteer for an extended period of time (three or more years) will be offered training opportunitieis to progress to Bander position after the minimum time commitment has been fulfilled. Bird Bander - Orientation: Volunteers will serve the duties of a Predator Patroller while their skills are being evaluated. Individuals able to volunteer for an extended period of time (five or more years) will be offered training opportunities to progress to a Trainer-level position, which would involve training fellow volunteers in Patrolling, Extracting, and Banding. The San Francisco Bay Bird Observatory, along with most other banding facilities in North America, sends our banding data to the Bird Banding Laboratory (of USGS), which stores all of this information. This collective of information tells us how far a bird may travel during migration and which path it chooses to take. Predator Patroller - Season: Year-Round. Time Commitment: Six months, one day per month. The Predator Patroller shift begins 10 minutes prior to local sunrise (San Jose) and ends 5 hours later. Extractor - Season: Year-Round. Time Commitment: Twelve months (one year), two days per month. Banding operations begin 45 minutes prior to local sunrise (San Jose), and end 6 hours later. Bird Bander - Season: Year-Round. Time Commitment: Eighteen months (one and one-half years), two days per month. Banding operations begin 45 minutes prior to local sunrise (San Jose), and end 6 hours later.